For my interior space project, I took a picture of the hanging shelves of shoes in my closet. Then I enhanced the colors on the computer because I was doing it in watercolors and wanted to have bright colors to paint. I like how each shoe that was in the picture was a completely different shape and had different colors. This was the first time I had used watercolors and I loved the results. For each color I layered the colors to make them brighter and more solid in color and in values. 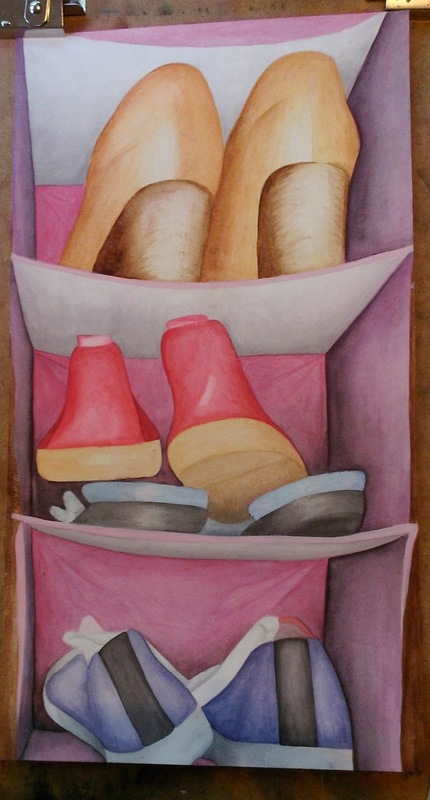 I really like how the red shoes in the center stand out because of the brightness of the watercolors. After I did the watercolors, I started drawing on top with pens to enhance the shapes and values. 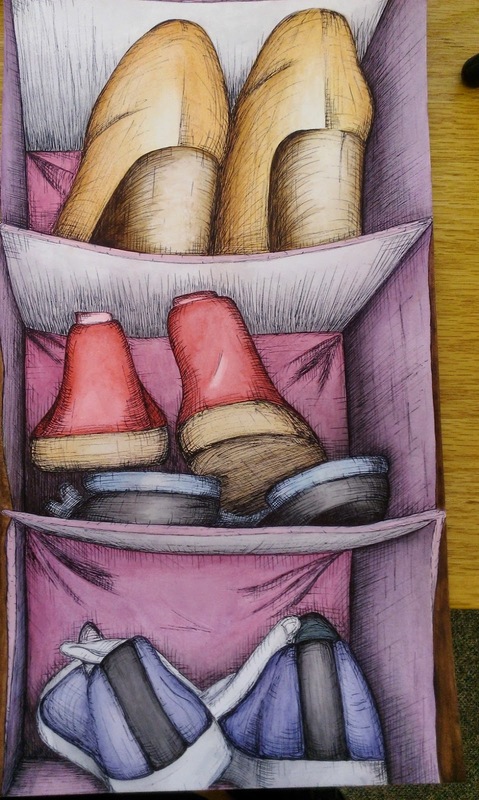 The watercolors made each shoe stand out with the colors and then the pens gave it value that completed the image. For the sneakers on the bottom shelf, they were originally black shoes, but Mrs. Rossi told me to try doing them in a different color so that there were more colors in the painting and they weren't just gray and black.The folds in the back of the shelves were hard to capture with the watercolors but once I did I really liked the results. However, when I did pen over the folds I added too much black and took away from the gracefulness and simplicity of the folds. That is one part I wish I had not done pen over or had at least done less.